If you are viewing this post you probably have one or more of the following questions in mind, which I will answer. What is the fee Chase charges when using international ATMs? Does Chase bank give me a fair exchange rate when shopping in other countries. What, if any, other fees are associated with international withdrawals and purchases when using a Chase debit/credit card. Is there a way to avoid these fees? Does Chase have any ATMs in Mexico? First, Chase bank charges $3.00 $5.00(as of February 2011) Non Chase ATM fee when you use an ATM outside the U.S. that is not a Chase ATM. Although Chase is a big bank, I don’t think it is large enough that it is offers a competitive edge for international travelers. Second, does Chase bank give a fair exchange rate when converting your USD to other currencies on purchases? My answer is NOT REALLY. If you view your transactions closely, you’ll find that on top of the discounted* exchange rate Chase gives you, Chase bank also charges you an additional 3% to convert your money. See the screen capture of a few of my transactions below. The transaction Debit Card was for a total purchase of $1380 MXN (Mexican Pesos). Multiplying debit purchase by 0.08002899 translates to a charge of $110.44 USD. 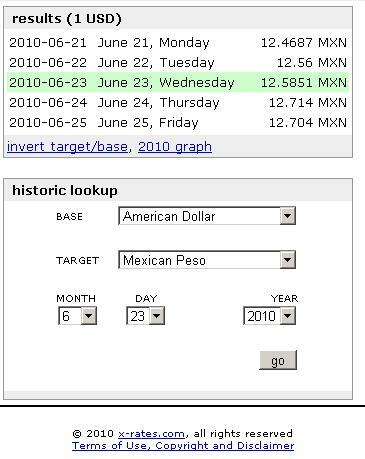 Which means that they took my dollar at $12.47 MXN a little less than the going rate according to x-rates.com (see below). Not a big deal, however in addition to that, you’ll notice an Exchange Rate Adjustment of $3.31 USD. Chase bank charges an additional 3% for regular debit card purchases. Now, I think the real injustice occurred when I used an ATM. When withdrawing $500 MXN (Mexican Pesos) on the same day, my dollar was discounted further. For the $500 MXN that I withdrew, I gave $43.80 in return plus an additional $3.00 fee. I understand the fees, although I think it is excessive, however the exchange rate charged is what is troubling. According to my statement I was charged .08002710 dollars for every Mexican peso I withdrew, which comes out to $40.08 USD. Then we factor in the Exchange Rate Adjustment of 3% or $1.28 USD in this case. That leaves us with $41.36 that I should be exchanging for the $500 Mexican pesos. However, I was charged $43.80 USD. What?! Where did that dollar and forty-four cents come from? That’s troubling. Effectively, for that transaction, I bought my Mexican pesos at premium because I received $11.41 pesos for each one of my dollars, when according to x-rates, the exchange rate that day was $12.58. Of course if you factor in the ATM fee, I am only receiving $10.68 for every dollar. I’m paying over 16% of my money to perform transactions like these via Chase. Yes, 16 percent. Show me an investment that will give me that continuous yield and I will put all my money into it!!!! Anyway, that’s upsetting. Moving on, what if any, fee is associated with Chase Bank if you decide to conduct international transactions? Well as we just saw, the 3% surcharge that will be added to your exchange rate. And possibly more depending on Chase Bank’s funny math. Is there a way to avoid these fees? Yes, but it may be too much to ask. Chase allows customers up to 3 free transfers to Banorte Banks up to $1,500 each transfer. I just confirmed it this morning with a Chase rep over the phone. The only caveat is that you have to initiate the transfer at your local bank. Also, you don’t need to have an account in Banorte. Apparently it’s like a free Western Union type service. Lastly, does Chase bank have any ATMs in Mexico? No. I also confirmed that over the phone. When compared to Bank of America, BofA customers are able to go to Scotia Banks and withdraw money from the teller line or ATM without any fees. Also, it has been my experience that BofA does not charge “Non bank ATM fees”. On several occasions when I withdrew from HSBC ATMs in Mexico, I was only charged the HSBC ATM fee of 70 cents. I never looked too closely at the exchange rates, but it was never alarming. I think the exchange rates were fair. Hope this helps my international traveler’s out there. Thnkyou for the information, it sure comes out handy as I am planing to travel to Mexico in the next coouple of months. I thing I am going to take cash or open a BOA account just for this trip. when you look at spending over 3000 dollars over in mexico, and conver the dollar into pesos, 1.00 peso for every dollar does make a big difference, as it would be about 300 pesos or about 80 some dollars lost in translation. I apreciate the information grately. Another bank to consider is HSBC. They are a global bank (US, Hong Kong, Mexico, France) and you may see less fees through them. Have a great trip. I want make a correction. Bank of America allows it’s members to withdraw money from Santander Bank in Mexico without a fee. I know because I’ve been doing this for almost 4 years. Please correct the article lest someone be misled. I started doing this myself, depositing money in my Bofa checking acct. and then taking out in mexico at a Santander atm, and not only did they not charge you, you also make a profit, i did this for 6 months, an in average i was making 35dlls for the transaction, i had 4 acts, so i was making like around 70 to 140 dlls per day, depending on the international rate. I have other friends who do this on a regular basis and the make a lot of money just by doing this, since we live in a city border to the us we can go back an forth. Unfortunately my accs. where canceld by Bofa, have you had any problems like this?? That’s cool that you were able to turn on a profit on exchange rates. I’ve never attempted to do so, but I don’t see why they would close your account for that. It seems to me like you were acting like a currency trader/investor. But you were probably able to turn around a profit much faster. One possibility is if the account you were drawing from was a Savings account, then that’s probably why they shut it down. They implemented new rules on transactions post 9/11. But even under that case, I thought they would just convert the savings into a checking account. Strange outcome but interesting story. Thanks for sharing. Thank you for the article. I wish more people would show outrage over the highway robbery of this crappy bank. I was with Washington Mutual before they were taken over by Chase and the service has been terrible ever since. However, they do consistently RAISE rates they charge. At least they have something going for them. I will be closing my accounts soon and they can prey on some other sucker. I think the best way to get the best exchange rate is by bringing cash. I was in Mexico last week, and got 12,50 Mexican Peso for each US $1. Even at the international airport, one must shop for the best exchange rate; they vary from booth to booth. Ask how much you’ll get before you change your money, because what’s posted may not be what you get. I’m going to Poland, Prague and Germany on Oct 31, and will bring cash to exchange even though I have a Chase Debit card. Banks are getting more desperate, because they’re not making money on loans, and the only place they can make money is to keep adding fees. That’s going to be our future with banks. What does anyone know about BBVA Compass Bank & its relationship with BBVA Bancomer in Mexico. Do they offer similar services as BofA or HSBC or Scotiabank Inverlat? WOW! I “Thank You” for this information!!! Very helpful. I’m on the way to Mexico and was very disappointed on the 3% on all charges, etc., etc. (jerks!) Think I’ll be transferring funds to Barnorte. Thanks again! I’m looking to travel to Central and south america and I’ve been talking to Ally Bank. They don’t charge any ATM fees from their end, and the transaction fee is only 1% (not 3%). So I’ll give them a try. Excellent article; very accurate. i am travelling in the EU and came across the exact same problem; Chase are really stealing my money if i use an ATM to withdraw local currency; on top of this they do something really illegal: the extra 3% that is mentioned in this article, is included in the money debited from the holders account!!! for ex. there is the 5$ fee and it shows up just like that: a fee, when i check my account activity online BUT, the extra 3% that they charge, is “included” in the converted dollar amount extracted as foreign currency @ the ATM; from a tax point of view, it shows that the money went to the customer when actually IT GOES TO CHASE; i am sure that the “honesty” of the bankers has no limit and they mention this to the IRS as well; yeah right; my last transaction had a real value of 102,54 $ plus, 5$ fee; online it showed up as 105,64$ plus the 5$ fee; the extra 3% they took showed up as an expense of mine; totally illegal; f%#! chase; people BEWARE: “GIVE MY THE POWER TO PRINT A Country’s MONEY AND I DON’T CARE ABOUT THE LAWS”….- Rothschild. Just got charged 3% withdrawing pesos from Banco Santander with my BofA ATM card. New policy. I guess it is due to people like saul who had been taking advantage of it to make money. What now? I just want to add that when traveling outside US, Capitol One Credit Cards does not have a fee for use outside US. I’ve been using this for a while in leu of taking debit cards and making my life easier. I have read so many content regarding the blogger lovers howevewr this paragraph iis really a pleasant post, keep it up.